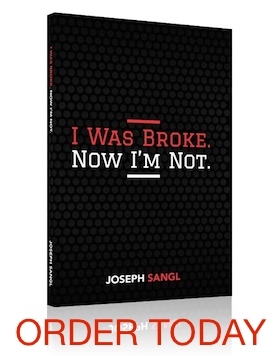 Welcome to a new series that will be appearing on a weekly basis here at JosephSangl.com – “Biblical Financial Lessons”. Proverbs 21:5 The plans of the diligent lead to profit, as surely as haste leads to poverty. This verse is the guiding principle of every financial decision I make. I may not know anything about you, but I do know this – you would choose profit over poverty every single time. We all want our lives to be profitable. This verse provides the map for a profitable life. Look at the verse again. It shares two key principles that will help each of us have profit. It states that “the PLANS of the DILIGENT” leads to profit. We must have a plan. Let me ask you a question – “Do YOU have a plan? For your life? For your marriage? For your MONEY? Having a plan is not enough, however. We must be diligent in following the plan! Diligence means that we are steadfast, consistent, persistent, disciplined, focused, and willing to persevere in spite of difficult circumstances. Do you follow your monthly budget? Is your life leading to profit or poverty? I would say the one most important thing someone can do for their financial situation is to start tithing if they are not yet doing so. Also, if you are going through financial hardships, and are tithing, do not stop! My husband and I both tithed before we met and married and even though we haven’t made a ton of money, him being a blue collar worker, and myself part-time clerical for the past 12 years since we married–yesterday the mortgage was paid off in full! I give the credit to God for giving us wisdom with finances and contentment with what we have. It’s a good feeling to have no debt, and also a little strange to think about. When we married, I made him change his 401K withholding to the max of 15%, which I had always done when it was available through my job. When we wanted to cut costs, we cancelled cable, got rid of our land line phone, donated a car that was not working–the non-profit took it because that make of car was worth fixing to them. We had only one car for over a year. He walked to work, as he had done for years anyway. Little things here and there were cut, which actually makes a person think more about things they can live without. Last year we went on an Alaskan cruise which was my husband’s first choice and this year we went on a New England cruise which I had always wanted to do. The money for this was put away so we’re not paying for a trip long after we’ve enjoyed it. I was laid off in August 2011 for the first time in my life. Right away I scoured the ads looking for a rommate, who now lives in our lower level, and the extra money is a great help. My husband has a terminal degenerative brain disease with dementia and was let go from his job of 36 years in 2010. Despite this, we have all we need and God has blessed us greatly. If we had never tithed, I truly believe, no–I KNOW it–that we would be very strapped financially and who knows, maybe foreclosure or bankruptcy would have been our experience instead. I know that I will most likely be alone in the future, but making the house payment will not be an issue. Thank you for helping so many people with their finances–the need is greater than ever!